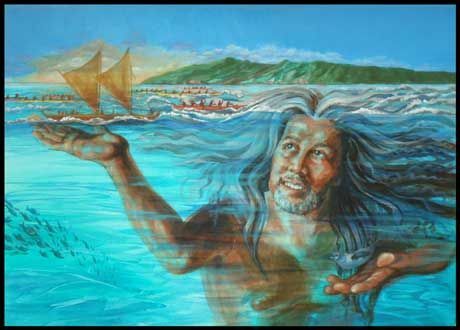 Kanaloa is the Hawaiian God of the oceans and all that live in those oceans. He is symbolized by the squid or by the octopus, and is typically associated with Kāne and there exists a vast amount of popular and mythical lore in which the two gods are named together. Both are invoked by canoe men, Kane for the canoe building, Kanaloa for its sailing. Kanaloa is also considered to be the god of the Underworld and a teacher of magic. Local legends abound in which the gods Kane and Kanaloa are represented as traveling about the islands establishing springs of water, and seeing that they are kept clear, for drinking purposes.